Here’s what’s up in the world of TV for Thursday, December 1. All times are Eastern. Steven Universe (Cartoon Network, 7:30 p.m.): Steven Universe gets into the holiday spirit as a blizzard hits Beach City. All that snow brings back memories of the time Greg and Steven got snowed in back when Steven was a baby. Eric Thurm was sold as soon as soon as he learned this episode is titled “Three Gems And A Baby.” But toss in the fact that Greg’s debuting a new song, and Eric might just have a new perennial holiday favorite on his hands. 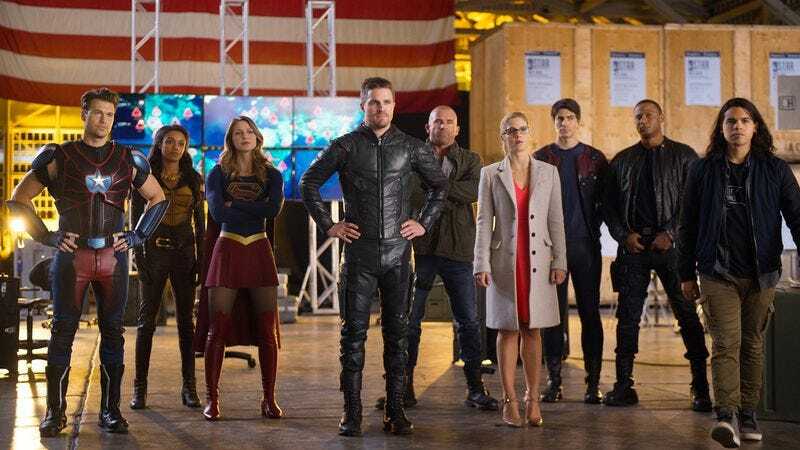 Legends Of Tomorrow (The CW, 8 p.m.): The CW’s massive four-episode crossover event wraps up tonight as Supergirl, The Flash, and Green Arrow team up with the Legends Of Tomorrow on their own turf. The massive hero team has to work together to defeat the evil alien Dominators once and for all. Elsewhere, Martin Stein becomes distracted by an aberration he caused in 1987. Oliver Sava has to assume that aberration has something to do with Victor Garber’s turn on the 1987 series The Days And Nights of Molly Dodd. The Great American Baking Show (ABC, 9 p.m.): ABC makes a second attempt at importing The Great British Bake Off stateside. Renamed from last year’s The Great Holiday Baking Show, the series pits home bakers against one another as they fight to be crowned America’s baking champion. The two-hour premiere features both cakes and cookies, which means the bakers will be asked to whip up a whole cavalcade of recipes. That includes Mary Barry’s apple-almond cake, which she’ll be on hand to judge herself. Here’s hoping none of the contestants wind up with a soggy bottom. A Charlie Brown Christmas (ABC, 8 p.m.): It seems like only yesterday that Charlie Brown was hanging out with the Great Pumpkin, but it’s already time for his Christmas special. ABC generally broadcasts A Charlie Brown Christmas a couple times during the holiday season, so if you miss it tonight (and you don’t have a DVR or a DVD copy), you’ll have at least one more chance to catch it before Christmas. Rosewood (Fox, 8 p.m.): Rosewood has an inadvertently timely subject matter for its mid-season finale. Dr. Beaumont Rosewood and Detective Annalise Villa jet off to Cuba for their latest case, where they presumably won’t be mourning Fidel Castro’s death, unless Rosewood was incredibly prophetic back when this episode was written. Either way, hopefully Rosewood and Villa will make it back to America before Donald Trump shuts down the friendly relationship between the two countries. Top Chef (Bravo, 10 p.m.): Top Chef returns for a 14th season tonight. Eight of the competitors are new while eight are returning chefs. In their first challenge, the newbies have to turn a whole chicken into as many dishes as possible, while the vets are asked to revamp shrimp and grits. The Charleston, South Carolina setting should add some Southern flare to the mix. Big Brother: Over The Top (CBS All Access, 10 p.m.): CBS All Access wraps up its first-ever online only season of Big Brother. That brings us one step closer to a world in which reality TV and The Sims are one and the same. Love Yurts (DIY, 10 p.m.): Listen, we’re sure this show about a yurt-building couple in Hawaii will be fine as far as these things go. But we just can’t let a pun this good (bad?) go unremarked upon. Stage Dad (Vimeo): Stage moms get all the glory, but this brand new web series shines a light on the less-celebrated stage dads out there too. Creators Alex Jacobs and Brendan Scannell star as a father/son duo determined to break into the competitive world of child acting. The mockumentary series has a slightly twisted edge, not least of all because its central 7-year-old is played by a twentysomething.